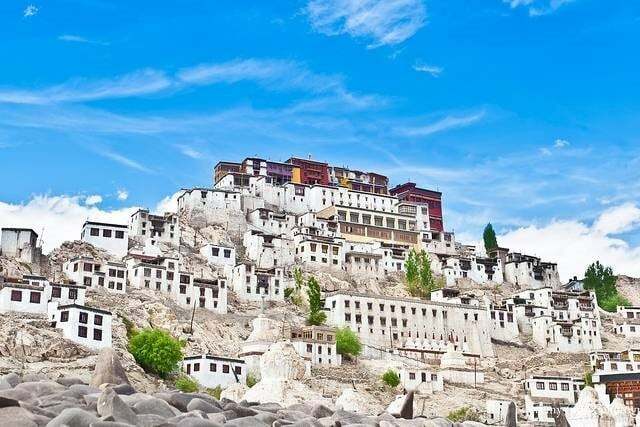 Leh, the main town in the district of Ladakh, in Jammu and Kashmir, India is without a doubt one of the most beautiful places in India. Set in a high altitude, the access remains restricted throughout the year, with roads being blocked for as long as six months. 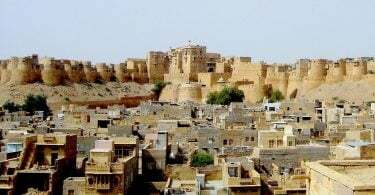 The roads usually open up in the month of May till Sept – October, and June – August have become the peak season especially after the popularization of the region in the movie three idiots, Jab Tak Hai Jaan. With the Leh – Ladakh season around the corner, I created a sample 7 – day Leh – Ladakh Itinerary which covers almost all the major attractions and can be used as a reference for anyone planning a trip to Leh – Ladakh. Start your journey to Leh – Ladakh by landing at Leh Airport during the morning hours. Without spending too much time, head out to your hotel, make yourself comfortable and stay put for the day in your room. This acclimatization is critical for your body and for you to enjoy the rest of your trip. You may be tempted to step out and explore the city, but all you have to do is control your excitement for the day and relax in the room. After a hearty breakfast head out to Sanchi Stupa to enjoy a panoramic view of Leh. 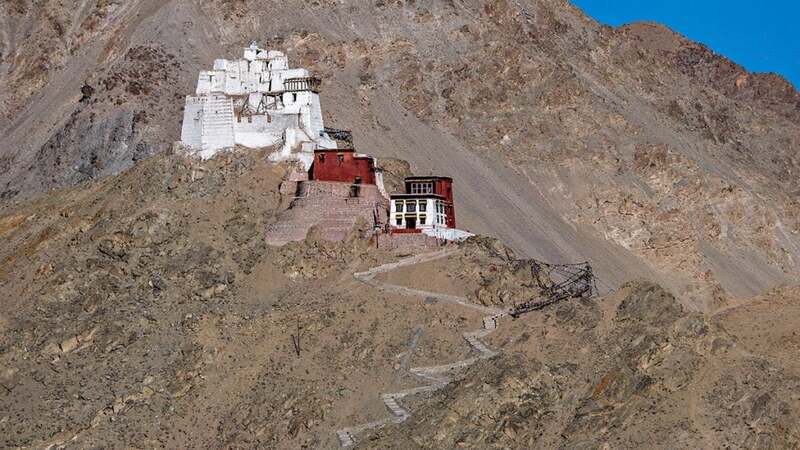 Your next destination should be Tsemo Fort, which is practically visible from all over Leh. Built in the 16th century is Tsemo (Victory) Fort, is just a 15-minute climb opposite Chenrezi Lakhang with its ruins. This structure is visible from everywhere in Leh. This fort seems like a crown on the head of the Palace ridge. This small but ruined palace contains a number of worship flags. Directly underneath it is Tsemo gompa that is Tsemo monastery that consists of two temple buildings built in the 15th century, an eight-meter tall gold-faced statue of Maitreya Buddha. Enjoy a good serving of typical Ladakhi food at one of the popular restaurants in the market, before heading out to Leh Palace, which is a replica of Lhasa’s Potala Palace. A nine storey structure in dun color, the Leh Palace rises against the backdrop of the lofty Himalayas, looking more like a painter’s muse. Built mostly of mud, rocks, and wood, it is grand in its simplicity. The palace also houses a rich collection of traditional dresses and crowns, thangka paintings and some impressive traditional ornaments. 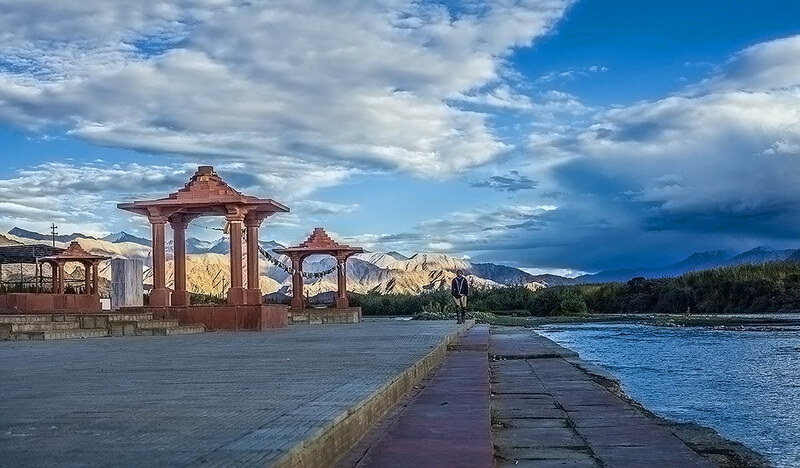 The best part about Leh Palace is its terrace for you can pore over Leh, Stok Kangri and the Zanskar range from it. Spend the later part of the day at the Hall of Fame, which is a museum constructed and maintained by the Indian Army in the memories of the soldiers who lost their lives during the Indo – Pak wars. One of the most interesting sections is the one dedicated to a soldier’s life in Siachen Glacier. Do some city shopping if time permits and your body doesn’t give in to the tiredness/fatigue. 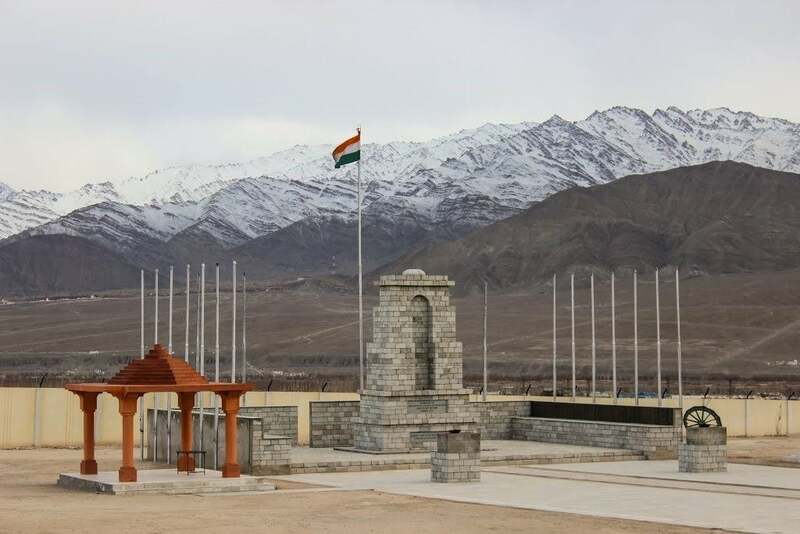 One of the major highlights of any trip to Leh – Ladakh is crossing the Khardung La Pass, the highest motorable pass built by the brave men of 201 Engineer Regiment, Indian Army. The road was opened to vehicular traffic on 27 August 1973. 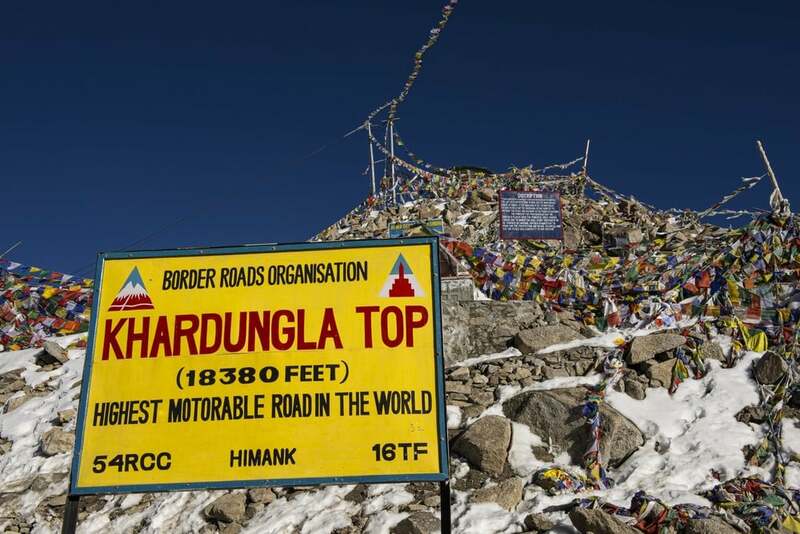 At an altitude of 18,380 feet, Khardung La Pass is the gateway to Shyok and Nubra Valleys. Khardung La is 39 km by road from Leh. The first 24 km, as far as the South Pullu check point, are paved. From there to the North Pullu checkpoint about 15 km beyond the pass the roadway is primarily loose rock, dirt, and occasional rivulets of snowmelt. From North Pullu into the Nubra Valley, the road is very well maintained (except in a few places where washouts or falling rock occur). While at Khardung La, don’t forget to have a cup of hot tea and a plate of hot Maggi at the Highest Cafeteria in the World. 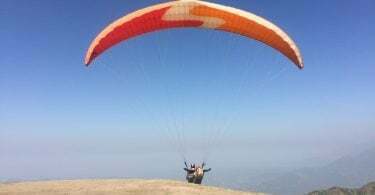 It is recommended that the maximum stopping time at the top should not be more than 30 minutes, so once you are done with clicking pictures and having some food, head out to the souvenir shop. The shop also maintained by the Indian Army sells all kinds of souvenirs like coffee mugs, beer mugs, decorative plates, tee shirts, and caps, etc. I have all of them with me. Cross Khardung La Pass and make your way towards Nubra Valley, Diskit Monastery, and Panamik. Panamik is famous for its hot water springs, and it’s also the last place up to which civilians are allowed on the road towards Siachen. Everyone has seen a camel at some point of time, but you should be privileged if you get to see a double humped camel. Head out to the Hunder sand dunes and catch a sight of the Double Humped Camels, which are an endangered species and the only place in India to see them is here at Hunder Sand dunes. This will remain a highlight of your trip to Leh – Ladakh. Stay for the night at Hunder/Nubra valley. 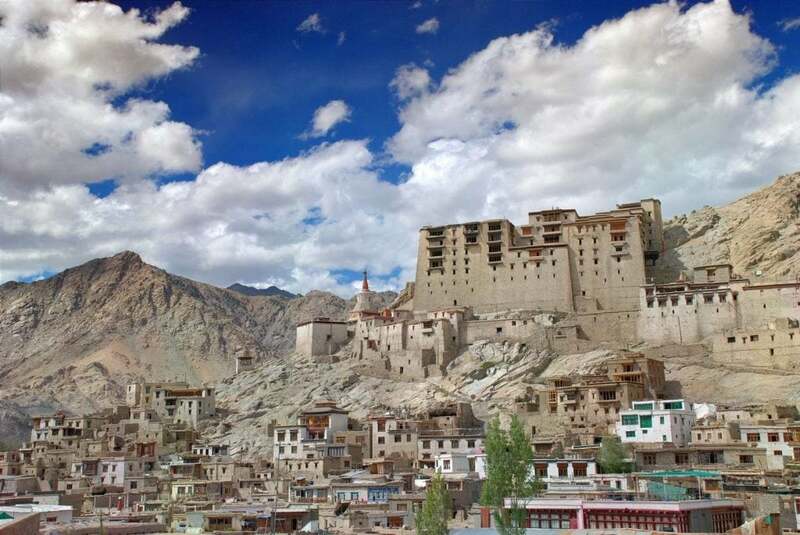 Start your return trip to Leh – Ladakh after a hearty breakfast, cross Khardung La top, enter Leh and head out to Thiksey Monastery, after having a good Tibetan lunch. The USP of this monastery is the 15 m high statue of Maitreya or Tara Devi. 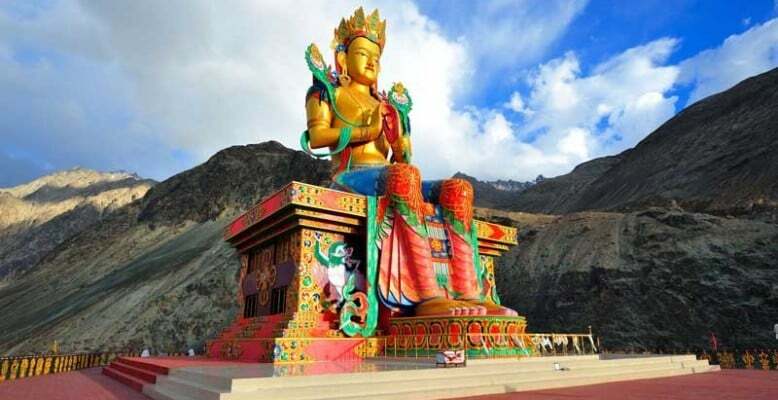 Covering almost two storeys, this is the largest such statue in Ladakh. 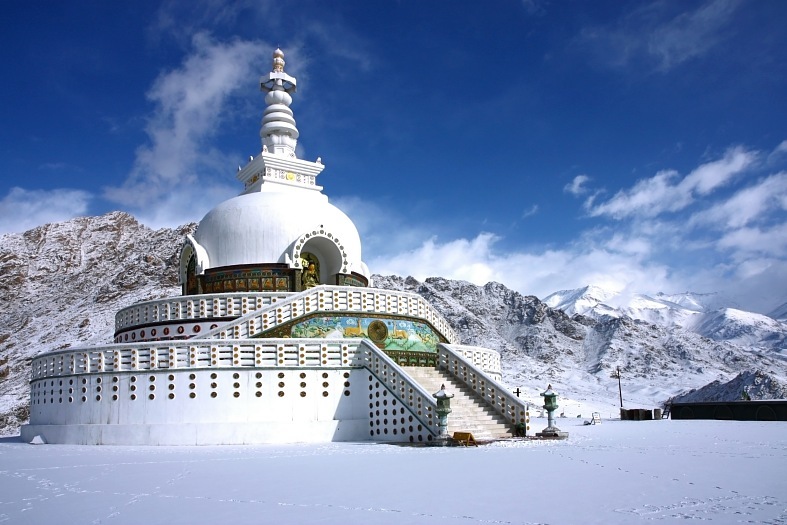 Just a couple minutes away from Thiksey Monastery is a quaint little spot named as Indus Viewpoint or Sindhu Darshan. Go there to enjoy the calm atmosphere and feel the fresh breeze kiss your face. A charming place like that demands some time where you only feel the breeze and hear the sound of water gushing by. Get some rest after the tiring yet fruitful day, only to wake up to a fresh new adventure the next day. After having an early breakfast, head out of Leh – Ladakh, towards Chang La Pass. When you are at the top of the third highest pass, make sure to click some pictures and have a hot cup of tea and some Maggi. Trust me, the tea and Maggi might not have tasted that heavenly ever before. 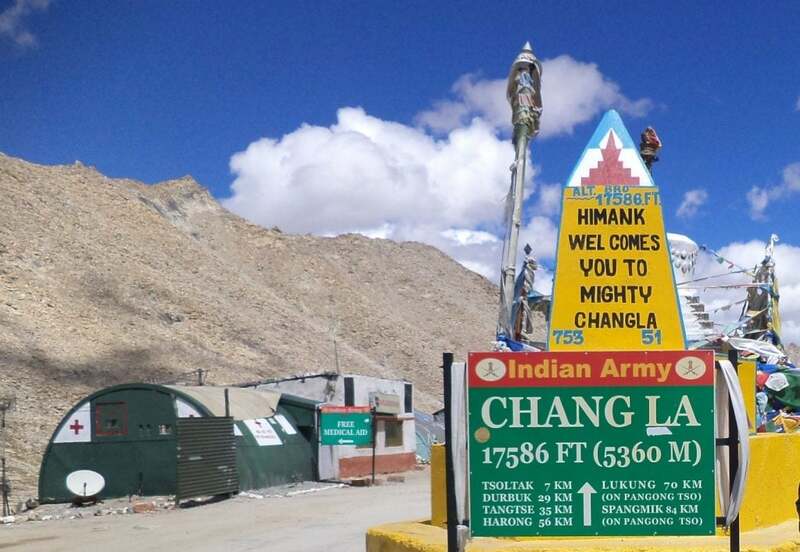 Cross Chang La Pass and head out towards Pangong Tso Lake which is 140 Km from Leh. 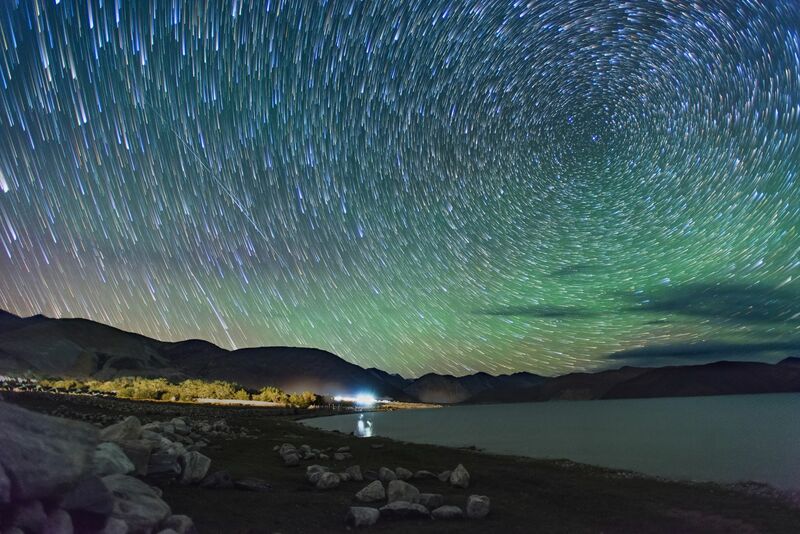 Situated at the height of 4350 m and almost 130 Km long, Pangong Tso is one-third in India and the remaining in Tibet. The first glimpse of the tranquil, azure blue waters and shaky lakeshore remains etched in the memory of tourists. On a bright sunny day, one can see as many as five different shades of blue along the length of the lake as you drive on the side of it. Stay for the night either at one of the camps or one of the homestay options in the nearby villages of Spangmik and TangTse. 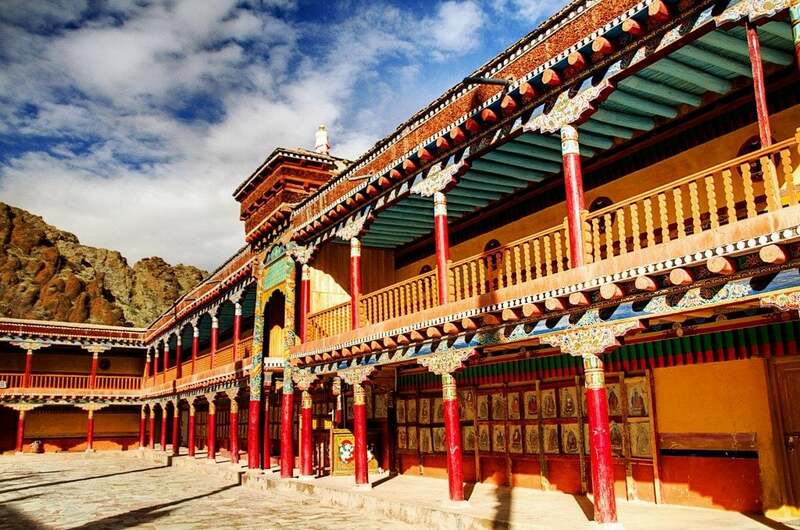 Start early and take your return trip to Leh – Ladakh, and on your way back, stop by at the Hemis Monastery. Hemis Monastery or Hemis Gompa is one of the richest monasteries as it was protected by foreign invasions because of its remote location and hard to access route. On your way back from Hemis, get your adrenaline rush at an all-time high by trying out White Water Rafting on the mighty Indus or Zanskar. Head out to Pathar Sahib Gurudwara and attend the lungar prepared by the Sikh soldiers of the Indian Army. Do try to help them in whatever way you can and then head to the point where you can witness the confluence of Indus and Zanskar. One can easily differentiate between both of the rivers, as one is muddy and the other one is a bit of the bluish-green tinge. 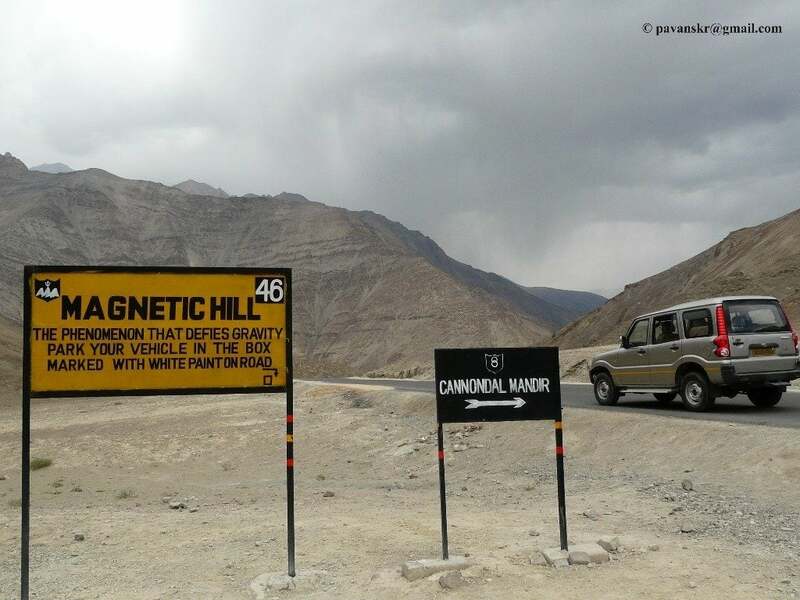 While you are in the area, don’t forget to get amused by the weird happenings at Magnetic Hill where, your car goes uphill on its own, when put into neutral gear. With loads of memories amidst mesmerizing landscapes, it’s time to say goodbye to Leh and fly back to your respective places, bringing your trip to Leh – Ladakh, to a great end. Leh is full of tourists all over the globe, so make sure to try out different cuisines like Ladakhi, Israeli, Tibetan, and Russian, etc. Souvenirs from Khardung La and Pangong Tso Lake. Leh – Ladakh Souvenir T-Shirts. Those who want to extend their trip to enjoy the beauty of Leh – Ladakh for a few more days can try out various trekking options in the Zanskar Valley. There are plenty of tour operators offering competitive prices for these short and long treks. 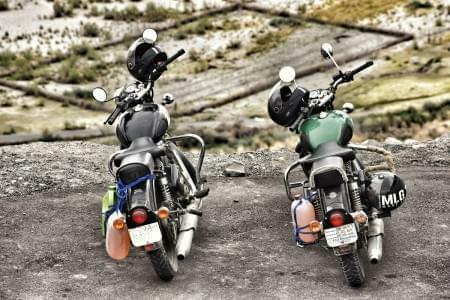 For the biking enthusiasts, the option of renting a bike and riding all the way to Khardung La and beyond is always open. Due to the huge demand, you will be able to find a lot of garages offering Royal Enfield’s on a rental basis. Day 1 – Arrive in Leh and rest for the day. Day 2 – In and around Leh city, cover Sanchi Stupa, Tsemo Fort, Leh Palace and Hall of Fame. Day 3 – Cross Khardung La Pass and head out to Nubra Valley, visit Diskit Monastery and witness Double Humped Camels at Hunder. Hot springs at Panamik. Day 4 – Return to Leh, and head out to Thicksey Monastery and Sindhu Darshan. 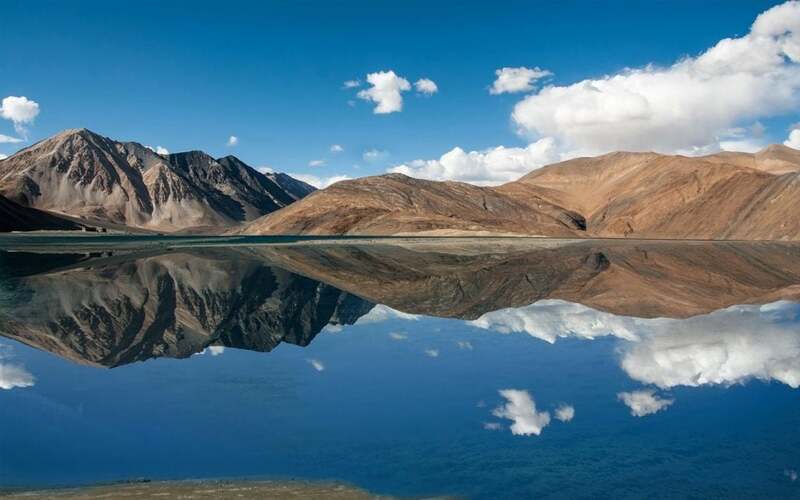 Day 5 – Cross Chang La Pass and be spellbound when you get a glance of Pangong Tso Lake. Day 7 – Cover Magnetic Hill, Pathar Sahib Gurudwara, and Indus – Zanskar Confluence. Day 8 – With loads of happy memories, say bye bye to Leh and board your flight. Trip to Leh – Ladakh Ends. A civil engineer by qualification, but a traveler by passion. Being an ARMY brat by birth, traveling and socializing is in his DNA. His belief is: “Go to a new place every month or two to explore, relax and live life to the fullest.” or basically to ‘Eat Travel Live’ and then Repeating the cycle over and over again. Read more about his travel escapades at theETLRblog.com.